Whitney Houston was the victim of an extortion plot over an alleged lesbian affair, it has been claimed. A heavily-redacted FBI file on the late singer states she was asked for $250,000 from a Chicago lawyer on the night before the premiere of her 1992 movie 'The Bodyguard', new book 'Whitney & Bobbi Kristina: The Deadly Price of Fame' has alleged. 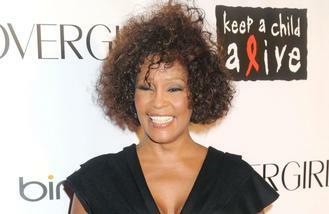 The extortion attempt came at a time when the 'I Will Always Love You' singer - who died in 2012 aged 48 - was dogged by rumours of an affair with her personal assistant Robyn Crawford, and the lawyer reportedly told an FBI agent their information included "knowledge of intimate details regarding Whitney Houston's romantic relationships and will go public with the information." According to the report, Whitney's father John Houston "settled the matter by sending a confidentiality agreement almost immediately," although it was "unclear how much money was paid to silence the person and whether he met the initial demand for $250,000." And one of the star's former bodyguards, Kevin Ammons, told author Ian Halperin - who has previously penned controversial biographies on the likes of Brad Pitt and Angelina Jolie, the late Michael Jackson and Celine Dion - that John was very worried the assistant would go public with her relationship with the 'My Love Is Your Love' singer. John reportedly told the minder: "We've got to do something about that motherf***ing b***h. She's ruining my family and driving everybody nuts. She's lost her grip on reality. I'll pay you $6,000 if you put the fear of God in her." Ammons stressed he refused the request and that John Houston then "warned the bodyguards to 'keep an eye' on Robyn." The book also revealed Whitney gave Robyn a black Porsche "as a token of their friendship" on the day she married Bobby Brown. Rixton’s Jake Roche: Dad Shane Richie hasn’t heard album. Kanye West is reportedly close to withdrawing his support for the music streaming service Tidal. One Direction deny X Factor judging role as speculation intensifies. The Rolling Stones could be headed to the studio to record a new album. Ed Sheeran and Sam Smith have contributed to “truly outstanding” British music sales in 2014 which achieved the highest market share in five years. One Direction will apparently take a break next year. Sam Smith "can speak again" following three weeks of silence. The PPL People's Pop Chart 2014. It’s official: We Love Our British Music.